Park City, UT – He took his legendary flip on skis resort to resort, hop-scotching from Boyne to Heavenly, Sugarbush to Aspen and on to Park City. He found a home at Deer Valley, arriving on a handshake and a look in the eye from his friend Edgar Stern. He exuded grace and elegance while carving picture perfect turns down Bald Mountain or entertaining guests by the fireplace in the lodge that bore his name, always wearing his signature Norwegian ski sweater. He was regarded as the father of freestyle and the patriarch of style in modern skiing during the formative days of the sport. He helped make skiing what it is today. But in his heart, what gave Stein Eriksen some of his greatest pleasure until his passing this week was following the sport of ski racing that helped define his own life as a young boy in Norway. Stein Eriksen may have been born a Norwegian, but his charisma and passion for the sport touched every skiing nation. The son of a ski maker father and forward-thinking mother, he grew up as a gymnast on skis in a nation where winter sports were ingrained into the culture. His athletic accomplishments as a ski racer captured the attention of the world, winning gold and silver at the 1952 Olympics near his home in Oslo, and taking triple gold in 1954 at the World Ski Championships in Åre, Sweden – one of only a handful of athletes to achieve such success. Like many successful European skiers of the time, he crossed the Atlantic where he helped change the face of skiing in America over the next six decades, earning him a place as an honored member of the U.S. Ski and Snowboard Hall of Fame. In the trophy case at Stein Eriksen Lodge at Deer Valley Resort, his collection of pewter cups, crystal and championship medals – all kept meticulously clean – tell the story of a legend whose prime motivation was giving back to others through skiing. Amidst the collection of hundreds of trophies, those three gold medals from the 1954 World Championships stand out. Austrian Toni Sailer would match the feat with four gold in 1956, then Frenchman Jean-Claude Killy 12 years later. But it would be another 45 years until another skier could equal the hat trick Stein had achieved. 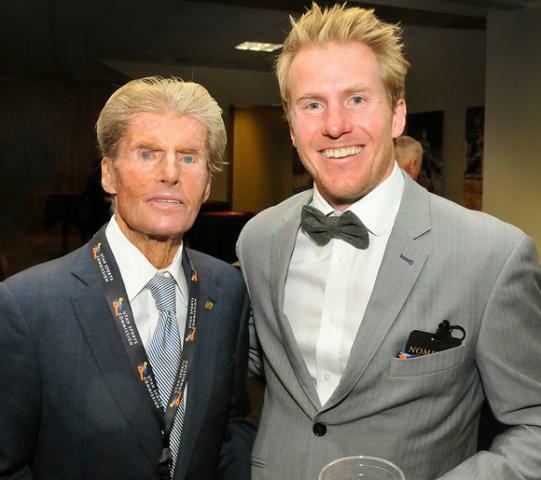 That one would be very special to Stein – it was Ted Ligety, who grew up in Stein’s hometown of Park City. It was a snowy spring day in the plaza at Park City Mountain Resort in 2013 when Ted Ligety’s hometown welcomed him back after taking triple gold at the World Championships in Schladming. Stein Eriksen was there to greet him. As Stein stood on the stage looking out at the sea of fans, memories came rushing back to that period of his own life when he was a young ski champion. Stein Eriksen had never been prouder than he was in putting his arm around hometown hero Ted Ligety to welcome him back a hero. But for Stein it was less about Ted’s crystal and gold. It was more about his heart. 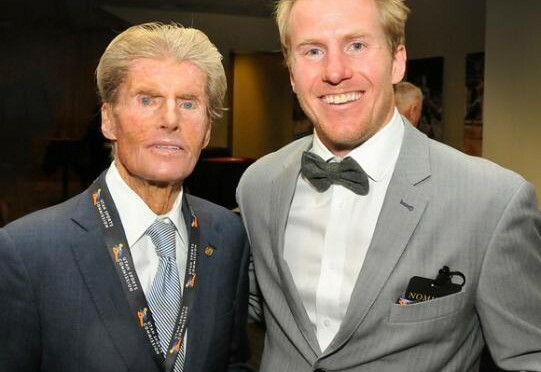 It was about humility, calling him a “gentle winner.” In Ted Ligety, Stein saw an example to get more kids off the street and up on the mountain. Through all his 88 years, Stein remained a true student of the sport. He followed ski racing intently. When you saw Stein at a party or on the mountain, he loved to talk about his beloved Deer Valley. But you really got his attention when you asked him about the U.S. Ski Team. Ski racing remained his passion. As Stein Eriksen looked out at the young racers packed around the stage, hanging on his every word, he gave them one bit of parting advice. In a recent TV interview together with Ligety, Stein shared his own thoughts on what makes a champion. “It has to come from childhood and from the inside – from you and people around you. It has to be a desire on a friendship basis with the competition as friends. You have to be a happy person. It’s such a privilege to see how athletes react – how they act with a certain amount of respect, a certain amount of mellowness. Stein, you have led by your example and you have taught us well.